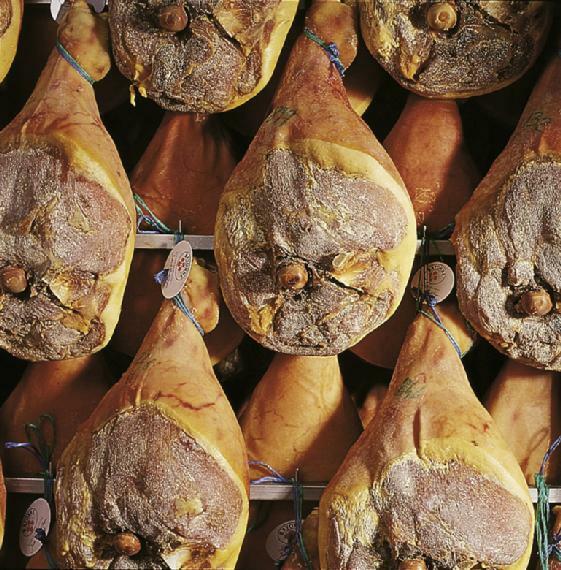 Nothing is kept secret, since confidence in any product is based on transparency, allowing time for all the different stages to be completed, all of which play an essential rôle in the maturing of Bayonne Ham. 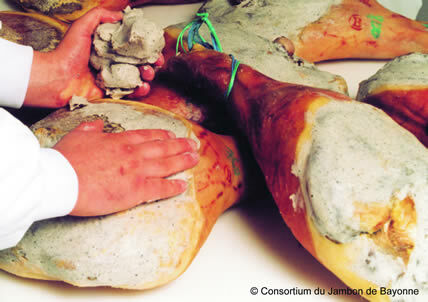 Whole fresh hams are rubbed with salt from salt workings in the Adour river basin. 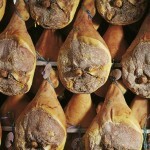 They are then covered with a thick layer of salt and put in the salting tub. 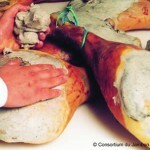 The hams are hung in a resting chamber, known as a souillarde (regional term for a back kitchen), which allows winter conditions to be imitated, drying the hams at a low temperature. The hams are placed in drying chambers where they start a long maturation process, which will ensure the best possible flavour, aromas and the soft melting texture of the finished ham. 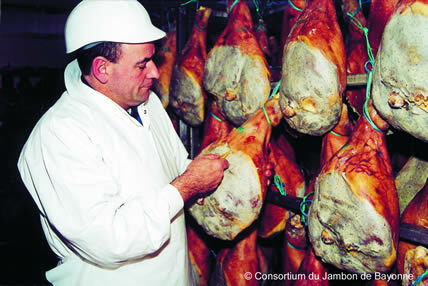 Pannage is a process in which a mixture of lard and flour is applied to the exposed muscle tissue of the ham. 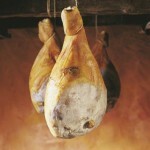 It moderates the rate at which the ham dries through the long maturation period. 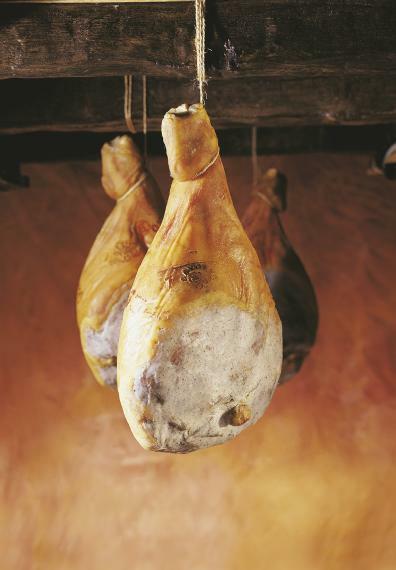 It is the final stage, where the ham will acquire all its qualities and reveal its personality: a sweet and balanced flavour, salted with a light hand; a delicate aroma, as well as its characteristic red/pink colour. 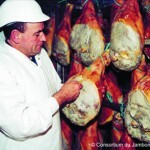 The hams are first judged by expert “noses” who will use a probe on the hams to grade them and define their taste qualities. 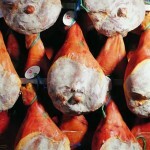 It takes an average of nine to ten months to make a Bayonne Ham, with a minimum of seven months. 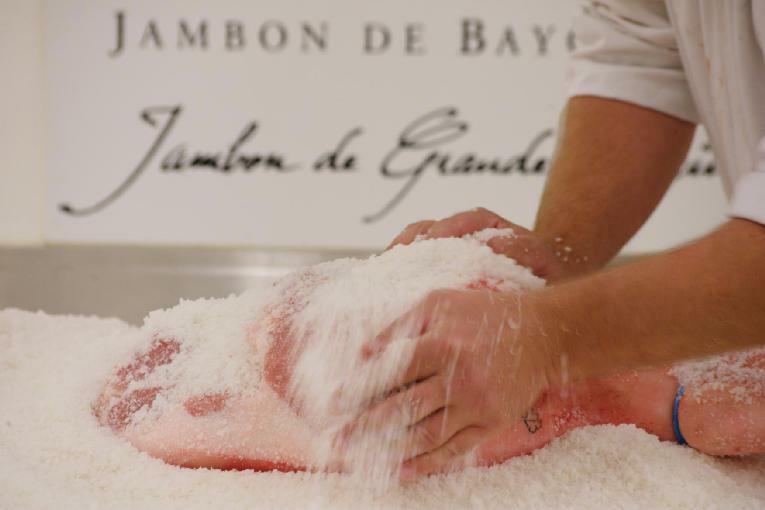 Finally the “Bayonne” seal, carrying the Basque cross or “Lauburu”, will be applied with a hot branding iron to all the Bayonne Hams that have met the selection requirements at every stage.